Featuring an impressive roster of arcade classics such as 1941, Captain Commando, Super Street Fighter II Turbo and Strider, Capcom Classics Collection Volume 2 is an impressive compilation that fills in the blanks left in the first installment. With classic shooters, fighters and action titles and a few pleasing obscurities, there's something almost any classic gamer will enjoy. The games themselves are flawlessly emulated, with standard and enhanced presentation plus support for progressive scan monitors. Add in a healthy number of extra features such as artwork and music and you have a solid package that should appeal to most retro fans. Even though last year's Capcom Classics Collection featured a fairly comprehensive look back at the developer's seminal titles, there were still a few noticeable gaps that went missing. With the release of this second volume on the PS2, many of these omissions have been rectified. The 20 titles offered this time around are all fairly solid and cover a variety of genres with a broad cross section of eras and styles. Most players will probably want to start by playing the classic brawler Super Street Fighter II Turbo, considered by many to be the pinnacle of the original series. We're happy to report that this version performs flawlessly, with all the special attacks, combos and moves you remember, perfectly emulated on the PS2. The game has held up remarkably well thanks to its refined balance, tight controls, brilliant design and appealing cast. This edition does everything you'd expect it to and also includes some extra artwork and training videos as unlockable content, making this feel even more complete and comprehensive. For gamers out there curious about the beginnings of the long running series, Capcom has also included the original 1987 Street Fighter in this as well. This version is excellent and its inclusion should help players make some connections and draw more direct comparisons. It cool to play just to see how much the has series evolved over time Despite the simple play mechanics and limited moves, the basic elements that would come to define the series are very much in evidence. While there's only one playable character, the brightly colored internationally themed backgrounds, colorful enemies and end of round taunts that came to define the SFII are all here, in a more primitive, primal state. Another classic many players probably remember is Strider, which was one of the most elaborate side scrollers of its time. Strider's flawless play mechanics and beautiful visuals are guaranteed to bring a smile to any classic gamer's face and this version is arcade-perfect. Capcom's 194X shooters made up a large portion of last year's installment, but the inclusion of 1941: Counter Strike fills in a few gaps. As the first game in the series to include a charge blast, it definitely shows how the game evolved and was a significant milestone in shooting games. Dig a little deeper under these marquee titles and you'll find a ton of cool, lesser-known games as well. Shooting aficionados will probably love Varth, which was Capcom's first released game and holds up well. The vertically scrolling presentation and spot on controls don't hurt much either. Many players probably won't remember it, but Side Arms offered some unique weapons and play mechanics and its challenging bosses and cool level design make it one of the most appealing games on this release. Another great obscurity is a shooter called Eco Fighters, with its bright vibrant graphics, awesome waves of enemies and tight controls, it's definitely one of the more obscure, yet enjoyable titles on this pack. 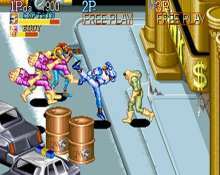 Several old-school brawlers like Avengers (no relation to the Marvel comics apparently), Tiger Road and Captain Commando offer gamers a chance to relive the time when you only needed two buttons to make a fun game. Captain Commando has a lot in common with the classic Final Fight, and mirrors that game's structure and presentation with large sprite based characters, a linear quest and somewhat limited controls. Playing Avengers is definitely going to bring back memories, and while it seems a bit limited these days, its simplicity and coolness comes in its appealingly straightforward gameplay and relatively mindless play. It feels a bit like Gun.Smoke, though its controls are tighter and smoother. The side scrolling fighter Tiger Road feels a bit dated, but the simple play mechanics make for a fun nostalgia rush. 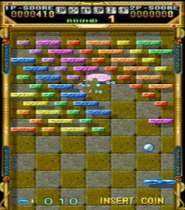 Likewise, other early to mid 80's titles like Block Block, Speed Rumbler and Magic Sword remain quite enjoyable today despite their simplicity, Magic Sword in particular has held up quite well. Not everything here is a winner: playing Black Tiger is sure to make players nostalgic at first, but the gameplay quickly becomes tedious and the uninspired visuals and controls quickly cause these feelings to evaporate. Likewise, Mega Twins is an excessively cutesy side scroller with lame graphics, an annoying soundtrack and dull gameplay that makes it nearly unplayable. Knights of the Round is a tedious and monotonous side scroller with washed out visuals and uninteresting gameplay. On the other hand, there's an interesting experimental game called Quiz & Dragon which is one of the most obscure games on the package. While the juxtaposition of hack and slash and simple Q&A trivia might seem off-putting, this is a surprisingly challenging and entertaining title. So much so, that the disc's trivia challenge seems to be modeled on it. Capcom also tried something unique in Three Wonders, which tried to squeeze three smaller titles onto a single game. Unfortunately, the size constraints mean the games are too easy and too short, but they are fun to play while they last. With such a rich history of games included, it would have been more than enough for Capcom to rest on their laurels. However, they've chosen not to do this and the PS2 version includes a wide variety of extras and features that make for a more robust package. By playing the games and performing certain tasks, players can unlock additional artwork, music and tricks to make the games even better. Each arcade cabinet has been perfectly emulated, but players can also select from a variety of presentations including standard letterboxed mode which preserves the games' original proportions, or use the enhanced version which makes the gameplay area larger. Additionally, this edition supports progressive scan for higher end sets, which makes the pictures even clearer. Overall, this is a solid collection that offers an excellent variety and depth of games, most of which have stood the test of time. Capcom Classics Collection's extra features, superb presentation and superb emulation of how emulation packs should be done, which makes it a must-own for any classic arcade fan.